This ministry has thrived through the years primarily because of God’s blessing and provision. We trust Him to work in and through all our efforts in order to build His kingdom and produce real fruit in the lives of seafarers. 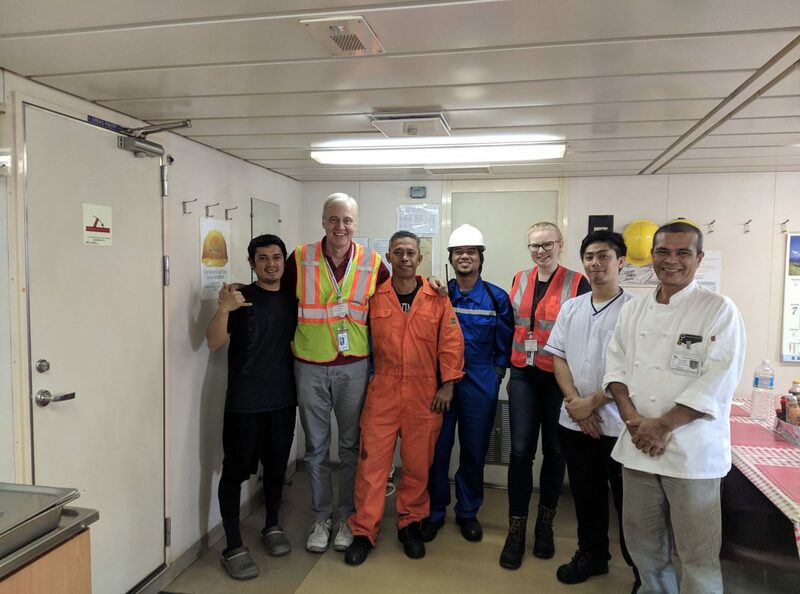 Seafarers – for their safety in their work and travel, for the strength they need to work – often at odd hours and on minimal rest, and for comfort for them as they spend many months far from friends and family. Families of Seafarers – they too experience the challenge of absence from their loved ones. Pray for their safety as well – for wives, children, parents, siblings, friends, etc. And pray for blessed times of reunion when that is possible. For Seafarers who know the Lord, pray He will be close to them, as they seldom have opportunity to worship in regular services. Pray the Lord would help them to stand strong amidst temptations. Pray especially for those who may be alone in their faith, whether among non-religious or those of other religions. Help them to be good witnesses for Christ in their roles on board. Pray that many more Seafarers will hear the Good News and come to faith in Jesus Christ as their Lord and Saviour. Pray that the Gospel messages that they hear – whether through this ministry or other seafarers ministries around the world – will find good soil and bear fruit. Pray more and more will come to know the true Joy of the Lord. Pray for our chaplains and volunteers who seek to serve and reach out to Seafarers with the love of Jesus. Help them all to truly love, care for, and serve Seafarers. And pray they will be able to share the Gospel with boldness and love. And please pray for God’s continued provisions for all that is needed to sustain this ministry. We have some dedicated volunteers, but there is room for more to get involved (see next section). With the changing financial arrangements in the two Classes of British Columbia, we are even more dependent on donations from churches and individuals (see below, “Give”). For those interested in more regular commitment, becoming a Ship Visitor is both rewarding and challenging. A ship visitor is one who goes to the ships to meet the seafarers on board, let them know about the Seafarers Centre, get acquainted with them as possible and listen to the things they may wish to share, and pray for them when appropriate. There can also be opportunity to lead in Bible studies and even larger services on board. In addition to visiting ships, we also need people to help out at the Seafarer’s Centres. Our centres are open in the afternoons and evenings, and it is especially in the evenings when we need assistance. Again, this ministry is especially on of presence – being available to listen, talk, pray, and just be a friend. A big need most evenings is for Van Drivers. Seafarers often call us asking for rides to the Seafarers’ Centre. Or later in the evening they may need a ride back to their ship. Sometimes they need rides to other nearby locations. Our goal is to be able to accommodate their requests every day, as our centres are open 7 days a week, 365 days a year. We also have occasional needs for help with things like Christmas at Sea, the Cycle for Seafarers fundraising ride in August, the BBQ for the International Day of the Seafarer in June, and other such events. Some people get involved on a regular daytime basis, maybe once a week or once a month, to help with things like cleaning up around the place or administration. If you are interested to get involved please contact our chaplain at crcvanportchaplain@gmail.com, or call the office at 604-253-4421, for more information. Volunteering that requires official sponsorship, such as a port pass for entering the port, will involve also connecting through the Anglican Mission to Seafarers, with whom we partner. Again, our chaplain can provide more information. For nearly 5 decades the Ministry to Seafarers has received its primary financial support from the 2 BC Classes, with added support from individuals and some additional offerings from individual churches throughout Western Canada. Over the next couple of years this situation will be changing, as the classes restructure their finances. For MtS this will mean a reduction in support from the Classes – likely a gradual decrease over several years. Therefore, if this ministry is to continue, we will need to see a dramatic increase in the number of offerings received from churches, as well as more individual donations. Christmas at Sea – towards gifts that are given out to Seafarers during the Christmas season. Christian Literature Fund – towards Bibles and other literature that are distributed aboard ships and at the Seafarers’ Centres. If you would like your donation to go to a special project, please also designate that on the memo line of your cheque. Or donations can be made online through Canada Helps.